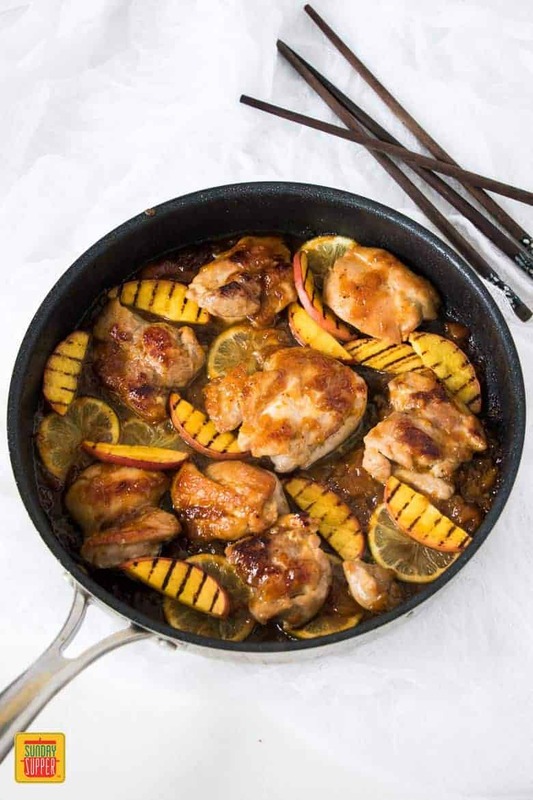 This Asian Peach Glazed Chicken is summer food at it’s best. Fresh peaches get transformed into a simple peach preserve, then added with some Asian flavors to create the tastiest peach glazed chicken you’ve ever had! This is it right here – Summer food at it’s best. Peaches are one of those wonderful fruits that work just as well in a main course as they do in a dessert. In this Peach Glazed Chicken recipe, I’ll show you how to make a simple peach jam, from scratch, using fresh peaches (but you could just as easily make it using tinned peaches). Then we’ll add a few simple Asian ingredients and lime for a delicious twist on a classic. This recipe for Asian Peach Glazed Chicken begins with a simple homemade peach jam. This is such a great way to use fresh peaches and it lasts in the fridge for up to 7 days, no problem (possibly longer but that’s as long as I could hold out to finish it all up). It is made by simply stewing down some chopped fresh peaches on the stove top with some sugar and lemon juice. Use it straight away or save it for another day. Of course, if you don’t feel like making your own homemade jam, you can certainly use store bought peach preserves but I highly recommend giving it a go. The flavor is absolutely unbeatable and it feels good to watch those beautiful fresh, plump peaches morph into an equally beautiful jam. 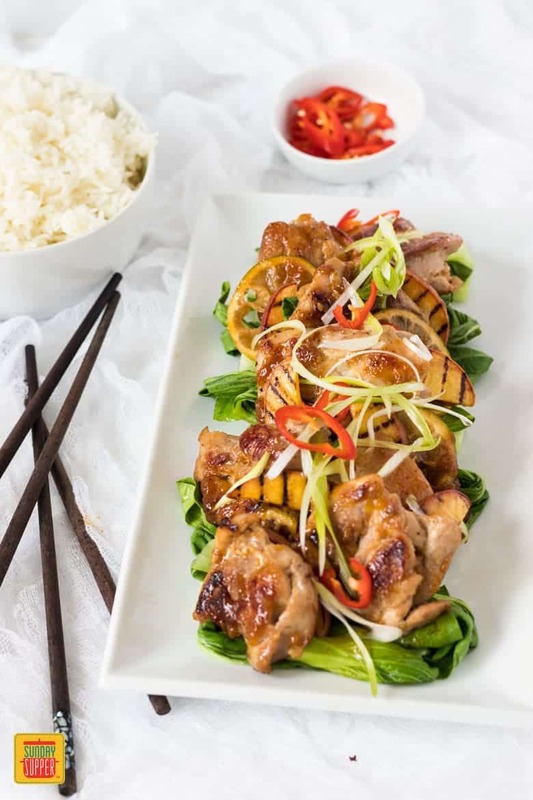 Once you have the jam ready, this Asian Peach Glazed Chicken is minutes away which makes it perfect for a weekday supper or a special Sunday supper gathering. I use chicken thighs for this recipe (skinless and excess fat removed) as they have such great flavor and, by cutting each one into 3 pieces, they cook very quickly. 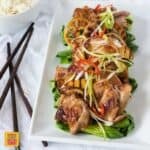 This recipe for Asian Peach Glazed Chicken is all cooked in one pan on the stove top – doesn’t this just keep getting better??? You simply saute the chicken in a little oil until golden on both sides, then add the peach jam with a few other key ingredients. Finally, add some slices of lime and you’re done. I serve this Peach Glazed Chicken with some simple Asian steamed vegetables and rice. Oh and don’t forget a few little grilled peach slices too. How about serving this Peach Glazed Chicken with a refreshing Citrus Peach Sangria or this Moscato Sangria (insanely delicious). Then, if you still can’t get enough of those gorgeous Summer peaches, try this Peaches and Cream Swiss Roll Cake or a Raspberry Peach Cobbler Galette for dessert. That’s it. You seriously need this Asian Peach Glazed Chicken in your life and so do your friends and family. The flavor is amazing, bursting with vibrant Summeriness and such a gorgeous way to use fresh ripe peaches in an easy weekday supper or when entertaining for Sunday supper. 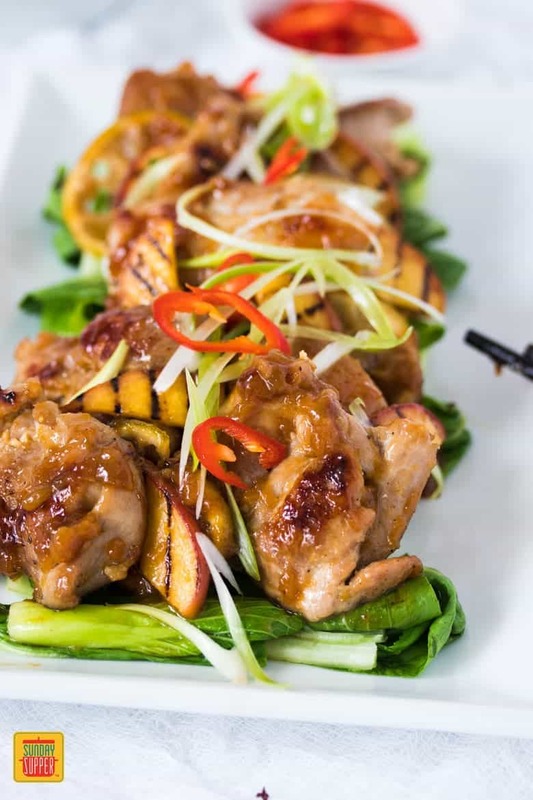 This Asian Peach Glazed Chicken is summer food at it’s best. 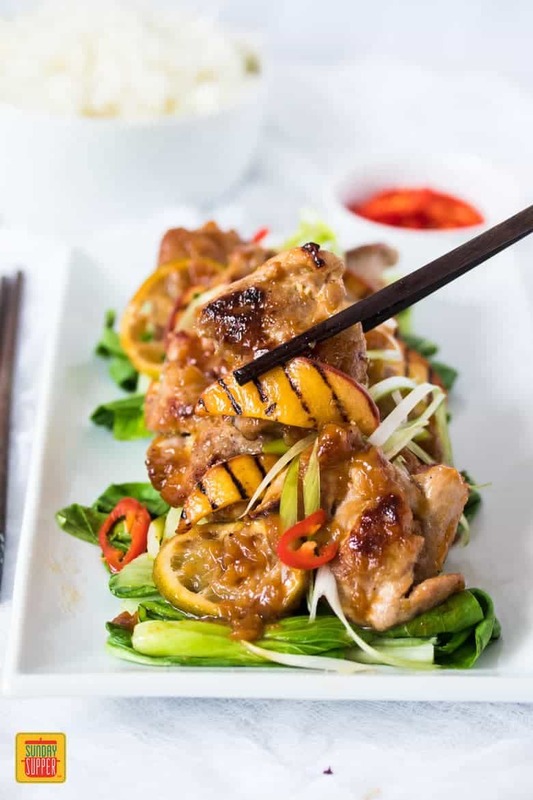 Fresh peaches get transformed into a simple peach preserve, then added with some Asian flavours, become the tastiest peach glazed chicken you’ve ever had. Add the sugar and turn the heat up to med-high. Simmer, stirring and crushing with a wooden spoon every so often, for around 30 minutes until the jam is very thick. Cooking time will vary depending on the ripeness of your peaches. If you want a smoother glaze, you can puree the jam a little at this point. If you've made extra or made the jam ahead of time, this is also the stage you can seal it in a clean sterilised jar to store in the fridge. To make the glaze, add the garlic, ginger, soy sauce, rice wine vinegar, mustard, sriracha and lime zest to the jam then stir well and set aside. Trim any extra fat from the chicken thighs then cut each one into 2 pieces. Season with salt and pepper on both sides. Heat the oil in a frying pan over high heat and add the chicken pieces. Cook until golden on one side, then flip over and cook until golden on the other side. Flip the pieces over again and drop a tablespoon or so of the sauce on top of each one, then smooth it over allowing some to drop into the pan. Cook for another minute. Turn the chicken pieces again and add the remaining sauce making sure to spoon some over each piece of chicken. Add the slices of lime. Cook for another 2-3 minutes or until the chicken is done. Serve with steamed bok choy, green onion, peach slices, chilli and rice. 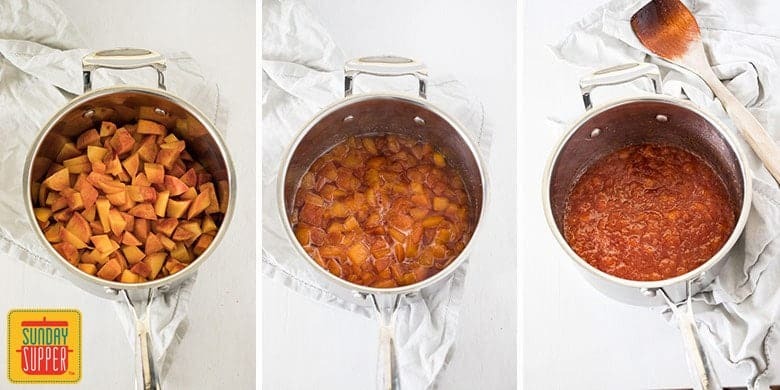 Feel free to use tinned peaches to make the easy peach jam if you're unable to find fresh, however, fresh are definitely better. You can substitute the homemade peach jam for store bought peach preserves.